No,the make-up is an integral part of the Kiss experience! Regarding The Elder,i think it may have been more successful as a concept album if they`d done it properly,lyrics,story etc included in the packaging instead of the very sparse package we got.Maybe if they`d incorporated the band characters into the story? So, you don't care for the non-makeup years? At this rate, it's pointless to take the make-up off again... as long as they keep touring, they might as well stick with the face paint and the costumes. Consider: KISS have now been around for 44 years, and the make-up-free period only accounts for about 13! Yeah. I was thinking about that the other day. It's been 20 years since the reunion. Second issue of KISS (Dynamite) is out this week. Brian,i didn`t say i don`t like the non make-up Kiss,i just think definitive Kiss is Kiss in make-up! Plus as you say,they are getting old,but in make-up they look ageless! Kiss was the first band I really got into. I was 10, or almost, when Destroyer came out, and I was hooked from there. I'm not really sure how it all came about. I guess just one of those things I picked up from friends, as they were the hot thing in 1976! I still remember buying Alive II a bit later and the tattoos that came with the album. I cracked my head right after I bought that album and had at least one of the tattoos on when I was taken to the ER! I never saw them in concert back then, but did see them three times on the Farewell tour in 1996-97. I'm not really sure how it all came about. I hear that a lot from KISS fans. It applies to me, too. Perhaps! Or perhaps, it's been so long ago that I don't remember! I remember knowing that they were a rock group that wore make up. But I can pinpoint the day I fell in love with their music. Playing baseball in front of a neighborhood friends house one summer day in '76. My friends parents were blasting their new Destroyer album out the windows, it really pumped me up. I was officially a member of the Kiss Army right then and there. Since I mentioned it in an earlier post, who is old enough to remember buying the albums and the goodies that came within? 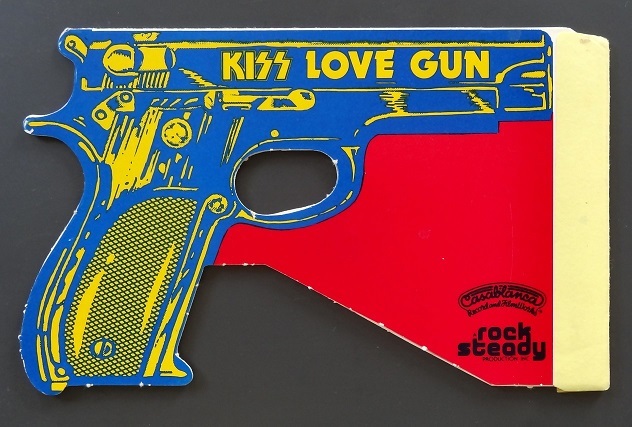 From Love Gun, there was a cardboard "love gun". 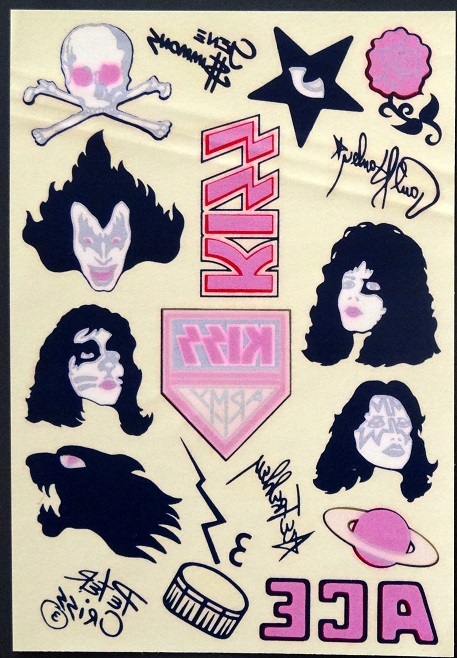 Alive II had a series of temporary tattoos. Rock and Roll Over had a large decal of the album artwork in I remember correctly. I don't know if Destroyer had an insert or not - I think I may have had that one on 8-track! I don't have them anymore but I remember getting posters from each of the solo albums. Yes,as mentioned previously,i had the Love Gun,The masks from the solo singles(except Ace!) the posters from the solo albums,and the poster insert from the Dynasty album. Also,being Marvel comics fans,how could we not be drawn to the cover of Destroyer? Then there were the ads in Marvel comics for the Kiss comic,with each member`s blood in the printing ink! Plus there were ads for the solo albums in Marvel comics of the time too. I missed your mention of that Bill! I didn't have time to read the entire thread earlier. My apologies! Love Kelly's art on Destroyer and Love Gun! I know a lot of people like the unused "brown" Destroyer cover art, but I like Ace and Peter's outfits better in the "blue" cover. Well, I learned something new today! I didn't even know about a different version of Destroyer! No problem Marc,i`m enjoying the conversation! KISS #2 out today. I'll be picking up a copy later! KISS #2 was pretty good. Story progressing at a relatively slow pace. The youngsters are atop the surface world now. KISS robots are pursuing them (think of the robots as being akin to ED-209). The Elders underneath want some of the kids back, considering the others to be expendable. And all is not what it seems. You ARE listening to The Elder while reading it, aren't you? There`s a whole new thread...`How do you listen to music`? I love reading with background music as aural wallpaper,music while driving helps me concentrate,but i also like to listen seriously,either with headphones and closed eyes to focus on the nuances! I also like to listen while reading the liyrics,especially with concept albums! Then there is listening via the surround system with 5.1 discs! Mostly all music, all the time! In the car ride to work, at my desk, on the way home, sometimes at night before bed. And CD's or radio every other time we take the car out!